The HTTP texture corruption bug mentioned in an earlier post and on the forum. The Wear/Add inventory action bug (basically, Wear on an attachment in your inventory does the same as Add, where it should actually replace the attachment, the same way as “Wear items” on a whole folder in your inventory does). The workaround for the HTTP texture corruption bug is to turn HTTP Texture fetching off, in Preferences -> Advanced -> Graphics Tuning; after doing so please clear cache and relog. The Wear/Add bug will be fixed in the next release. there’s a nasty bug in current versions of Dolphin viewer, which leads to some textures not loading properly. The textures in question turn completely black, with a tiny version of the actual texture in the top left corner. This only affects textures on prims, not on system clothes or skins. If you have this bug more often than you can stand, turn off http texture fetching under Preferences -> Advanced -> Graphics tuning, then clear cache & relog, and keep http textures switched off until the bug is fixed. If any of you downloaded 1.5.35.3627 before 2:30 pm SLT, please download and install it again. Fixes issue that arises from wearing a tintable tattoo layer (avatar sometimes appeared ruthed to others that were logged into the same sim where you were). A prim alignment tool built directly into the edit floater. Backport to Snowglobe 1.5 thanks to Hg Beeks. Torley’s Windlight settings added to Environment Editor. To activate them, go to World -> Environment Settings -> Environment Editor; then choose either Advanced Sky or Advanced Water, and apply Sky or Water Presets from the drop-down box. Preferences -> Advanced -> Graphics Tuning to set the level of detail for sculpties (the “RenderVolumeLODFactor” debug setting). Solves the slow texture decoding/grey textures on attachments, and brings the HTTP texture fetch worker back to what it was in Snowglobe v1.5 since the v2.2 worker apparently doesn’t work well with some textures and sculpties. As a result, HTTP texture fetching is now back off by default in 1.5.34. You can still enable it via the Preferences -> Advanced -> Graphics Tuning -> Fetch textures by HTTP toggle. Makes the HTML links clickable in group notices. For now, this works only in the blue pop-ups, not in the notices archive on the group info floater. Fixes the “unsupported graphics card” message for newer graphics cards that in fact work just fine. Fixes a crash condition that could crash the client when you empty your trash directly after deleting a folder. Brings RestrainedLove support on par with Marine Kelley’s v2.2.0.1. See the changelog at the end of the RestrainedLove ReadMe for details. This new version improves the capability of rezzing of objects without Land Group active. In this new version, the work around can be toggled off. See this message for details. Fixes GCC 4.4 compiler warnings. Adds the color/tint parameter to the Tattoo wearables, bringing them back on par with viewer 2.2 tattoos. Minor change, related to the delay between the rezzing of your avatar after login and the moment when the viewer auto-reattaches the multiple attachments on your avatar (decreased from 15 seconds to 10 seconds). Inventory window has collapse and expand buttons (from Phoenix). Inventory has the the Phoenix quick filters. 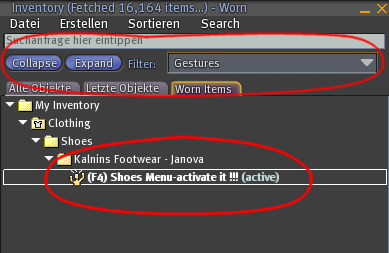 Inventory “Worn” tab now shows active gestures too. Download is here, as usual. there is a rebranded Build 32 on the download page, but it doesn’t have anything new, except a new version numbering scheme that makes more sense than the old one. The old scheme was like this: 1.5.0.3627.32 means based on Snowglobe 1.5.0, SVN revision number 3627, and it is build 32 of Dolphin viewer. The new scheme is this: 1.5.32.3627 means Dolphin Viewer 1.5.32 (based on Snowglobe 1.5.0 SVN revision 3627). The Windows installer isn’t going to annoy people with its “You seem to already have version soandso, do you want to reinstall” anymore. In the crash and usage statistics that Linden Lab sends to TPV developers I’ll be able to see how many people use which version for how long, not just all jumbled together in one “Dolphin Viewer 1.5.0”. Like I already said, there are no new features in this package at all, so the download is totally optional. The crash bug mentioned here has been fixed. The default behavior when you double-click on an attachment in your inventory is not “wear and replace” anymore, it is “add to outfit”, to make the use of the new multi-attachment support easier. That means, that if you double click, the attachment that was previously there stays, and the new one is also added.